viel Wasser und gutes festes Schuhwerk! Un lieu merveilleux à passer ses vacances. Très agreable, on se sent vraiment bien. J' aime la vue magnifique sur le rivière, le Vidourle. Le plus volontiers je serais restée un peu plus long! Es ist ein wundervoller Ort um die Ferien zu verbringen. Die Wohnung ist unglaublich gemütlich, sehr liebevoll eingerichtet und dekoriert, einfach zum Wohlfühlen. Der großartige Blick über den Fluss und auf die alte Brücke ist am besten von der einladenden Fensterbank zu genießen, und wenn man zeitig genug wach ist, kann man von dort aus sehr eindrucksvolle Sonnenaufgänge sehen. Sauve selbst ist auch sehr einladend und schön, klein und entzückend mit fröhlichen und freundlichen Einwohnern. Tori and Jim it’s always a pleasure to welcome you two! I look forward to returning mid-March for a walk on Le Chemin de St Jacques! À bientôt! Perfect retreat in a picturesque setting! My daughter and I spent an amazing long weekend at Alison’s place. Both the apartment, and the village were exactly what we needed after a hectic week of touring Paris. 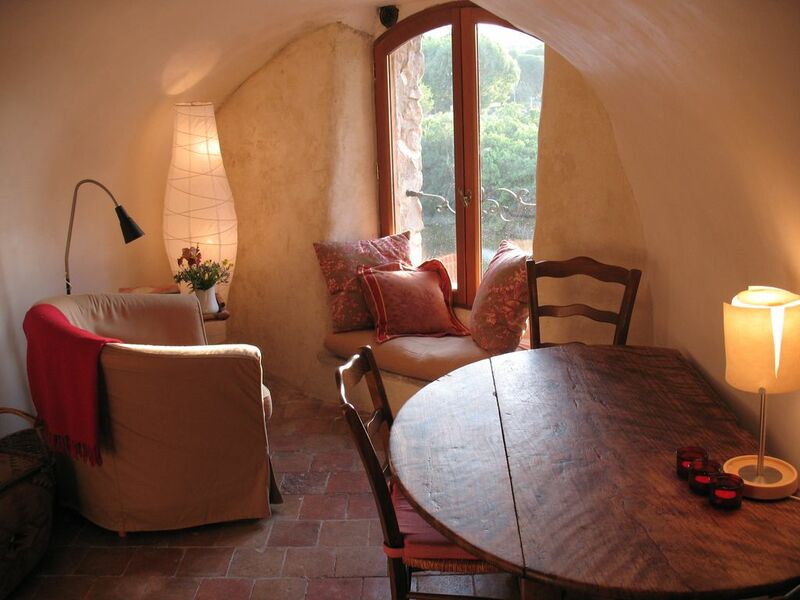 Originally we intended to use the Sauve apartment as a central point for touring Southern France, but once we arrived, it became apparent that we didn’t need to leave. The apartment was lovely and comfortable, the views were extraordinary, the village welcoming, and the dining options phenomenal—La Tour de Mole is a must! Get your coffee from Fouzia, the owner of the Epicerie downstairs—walk across the river for the freshest of delectable pastries from the Boulangerie, and spend relaxing evenings having cocktails in the public square just outside your door... highly recommend!! a truly magical place. The memories will linger until you return again, which you must! A medieval apartment in a medieval town... It really is dreamlike. the apartment is filled with art and nice touches. The bedroom floor stays deliciously cool even though it was really hot outside. The town of Sauve was wonderful too: almost every evening live music in the town square. Don't expect luxury or lots of space, but that is not what Sauve nor this apartment is about. Just go back in time and live with the people of Sauve. Thank you for a magical week! L'appartement est très agréable, ambiance cosy. La vue est magnifique. Nous avons passé un excellent séjour. Quaint, atmospheric, but impractical. We do not recommend this gîte. Very difficult outside access for anyone with reduced mobility due to irregular stairs, a steep slope (no hand rail either), while inside, the actual steep stone stairs were a risk as well. Adequately furnished but too much was actually housing the owner's belongings. Overall effect was rather cramped. Negotiating the stairs at night to use the toilet meant my wife had to sleep in the single bed outside the bathroom! No ventilation in the bathroom/ toilet led to condensation which was made worse whenever it rained as the wall next to the window became very damp; instructions during and after rain, were left for us to remove soft furnishings, (cushions etc.,) away from that window. There was no timer or thermostat for the hot water which was absolutely scalding; particularly with metal taps that turned the opposite way around! Immersion heater and washing machine shared the same plug and we queried the loose wire from the plug of the heater but were told that this was 'normal'. We did not notice the absence of television set or micro wave oven on the site details, but both items were sorely missed. The hand written book of 'do's and dont's' was detailed but failed to give information about doctors, chemists, nearest hospital etc... Tourist information that was left out was stale, going back two or three years. On the plus side the lady who met us was very helpful, made up the spare bed willingly and returned to fix the temperamental WiFi. The owner with whom we raised our initial problems offered to give us our money back and help find somewhere else, but having put in so much effort, we decided to stay especially as the first three days were taken up with a wedding nearby, (our main reason for renting the gite). In the absence of a visitor's book it would be difficult to verify that we were the proverbial 'exception' in raising the problems listed above. The beds were comfortable but difficult to make due to poor access. The two floors were clean but cluttered and we had to keep our empty bags and boxes, in the car. Great views from both windows over the river and its wildlife - especially in the morning - but we missed not having curtains at night due to the well lit car park below. The site may give marks of 5 out of 5 which seems incredible. We certainly cannot recommend this place which we do not believe meets with minimum standards and is anything but... 'romantic'... Have HomeAway/Abritel actually vetted it??? When I go traveling, I look for an accommodation which exemplifies the authentic beauty and quaintness of the place in which it is located, and allows me to imagine the history of that culture. If I am going to attend a wedding I look for a hotel with a big bathroom and plenty of square footage to prepare for that important event. I also study VERY CLOSELY the photographs supplied and understand completely the floor plan before I rent a place. I ask questions of the hosts in advance if I have a special need. Everything about my rental is made clear on its HomeAway listing from the square footage, the stone stairs with railings, the entryway, the diminutive bathroom, the bedroom just off the bathroom, the bedroom curtains for shutting out light, and the absence of a television and a microwave. I planned the renovation of this 900 year old stone apartment and it is a lot like living on a schooner in the upper level. Everything has its place, just not an immense one. If large is essential, I rent large. If I want all the amenities I choose a place with lots of bells and whistles. As a seasoned traveler I know that if I do not ask the questions before booking a private residence my assumptions become resentments when I arrive to find my expectations dashed. Knowing my own personal requirements and limitations is my responsibility as the guest, not of the owner of the rental. The wording about mobility impairment being a challenge has been addressed in my listing. The hot water heater will be looked into. I am currently working on a plan to renovate the exterior facade with approval and assistance from the village, a complicated procedure in a designated historic village. Again as previously stated in several emails, I am very sorry you did not have a pleasant experience. Bon chance la prochaine fois. Sauve ist voll von vielen malerischen Kunststudios und Galerien, einer Feinschmecker-Épicerie namens Chez Fouzia, verschiedenen feinen Restaurants, darunter die Tour du Mole und die Trouquet Toque, Yogakurse, Konzerte, ein Flohmarkt und ein Musikfestival im Juni Festival im Juli, wöchentliche Samstagsmärkte und 1. sonntags Kunstveranstaltungen und Festivals während des ganzen Jahres. Reiten ist in der Nähe von l'Asinerie des Garrigues und l'Ecurie de Liouc und oft in den Sommer Pferden kann man erkennen, paradieren in den Fluss unten, um mit ihren Reitern abzukühlen. Ein schöner Weg verbindet Sauve um Quissac und schlängelt sich neben der Vidourle River, wo Naturliebhaber können blaue Reiher, Silberreiher, Biber, Bisam, reichlich Fisch, sowie viele Singvögel, Schmetterlinge und Libellen zu sehen. Für den passionierten Radfahrer die kleinen Straßen der Region bis in die Cevennen sind unübertrefflich. Für ein Kind sicher 5 km Radweg La Voie Verte versuchen oder 'das grüne Weg "eine alte Bahnstrecke jetzt bicyling, Wandern gepflastert, Laufen und Inline-Skating zwischen Sauve und Quissac. Vielleicht ist die atemberaubende Attraktion in Sauve ist die Quelle, wo der Fluss Vidourle nach der Reise 10km 'sous terrran' oder U durch den Kalkstein, aus St. Hippolyte du Forte um Sauve, plötzlich wieder auftaucht, am Fuße des Dorfes sprudeln aus tief in der Erde in den Fluss. Zu Zeiten hoher Niederschläge der Sound ist ohrenbetäubend und die Energie erstaunlich. In der Nähe Anduze ist ein großartiger Sonntag Ziel, wo ein Jahr lang Flohmarkt ist ein großer Grund, sich für Antiquitäten und Schätzen zu suchen. Die Stadt ist berühmt für seine reiche verglaste Pflanzentöpfe und Keramik. Genießen déjeuner in einem der vielen Straßencafés. Wählen Sie eine nach Süden im Herbst und Winter! In der Nähe von Anduze ist eine faszinierende Botanischen Garten als Bambouseraie bekannt zu sehen ist, mit jeder Spezies von Bambus. Uzès, einst ein kleines gallo-römischen villageand aus dem ersten Jahrhundert vor Christus, ist jetzt eine wunderschöne Stadt 8500 45 Autominuten östlich von Sauve, wo der schönste Markt bis zweimal pro Woche am Mittwoch und Samstag in der Stadt in einem Auto gesetzt freie Zone von reich ausgestatteten Kalkstein Wohnungen umgeben. Uzés war die Quelle des Wassers, das die Römer 22 Kilometer über ein Aquadukt nach Nimes und den berühmten Pont du Gard, eines der Wunder Frankreichs, mehrere Kilometer nach Nimes transportierten. ** Wenn die persönliche Mobilität von Belang ist, ist Sauve möglicherweise nicht die beste Wahl, da die Straßenbeläge an vielen Stellen uneben sind und die kleinen befestigten Wege häufig steiler sind oder Treppen führen.